Wing span: 1 - 1 3/8 inches (2.4 - 3.5 cm). 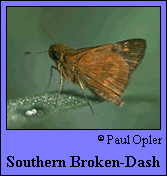 Identification: Upperside of male is brown with a few orange or red-oranges patches and a two-part black stigma (the "broken dash"). Female upperside is dark brown with pale orange spots. Underside of hindwing in both sexes is orange or red-orange and has a band of pale spots. Life history: Males perch on vegetation within 2 feet of the ground to watch for females, usually in the early morning. Females lay eggs singly on or near the host plants. Caterpillars live in nests of silk-tied leaves; when they come out to eat they carry a piece of leaf over themselves for protection. Flight: Two broods (sometimes a partial third) from April-October; all year in peninsular Florida and South Texas. Caterpillar hosts: Paspalum and St. Augustine grass (Stenotaphrum secundatum). Adult food: Nectar from flowers including pickerelweed, selfheal, and sweet pepperbush. Habitat: Openings near wooded rivers or swamps. Range: Eastern Texas and the southeastern United States south through the West Indies and Central America to Argentina. Strays north to central Missouri, northern Kentucky, and Delaware.